OK… my darling baby has just gone down for what is meant to be her second nap of the day (who am I kidding?) which means we have approximately 12.36 minutes to get this post out! I’ve painted red stripes down each of my arms because apparently that makes you go faster. In my last post about Greening Your Cleaning (see it here) I mentioned that I hadn’t found a good clothes washing solution yet. Well HUZZAH! I have for the past week been using a different blend and it has been awesome. I do some pretty heavy duty washing – I am using cloth nappies only! – and they come out as clean as ever. Best yet this is such a sensitive mix which is perfect for the soft little bum that is going to be wearing the garments. 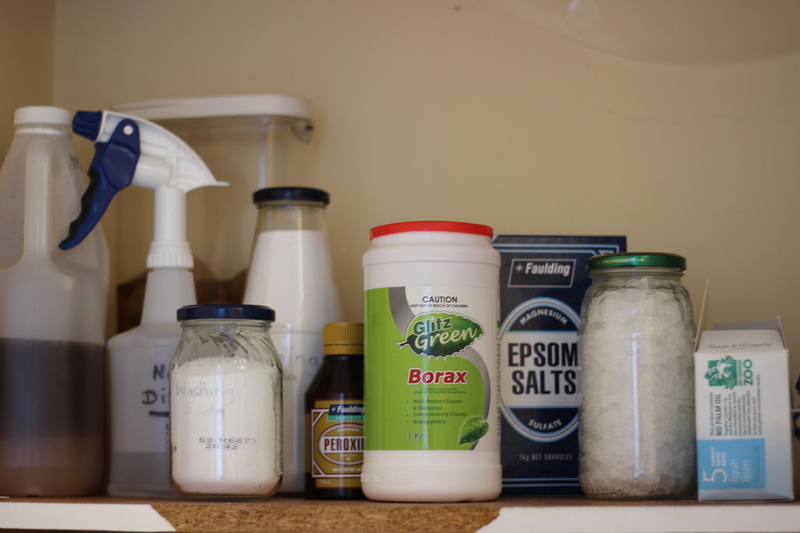 Add borax, washing soda and essential oil (if you are using it) and blend into a fine powder. I used 10 drops of tea tree oil and 5 drops of lavender oil for anti-fungal, anti-viral properties… as well as just a nice bit of smell! See I wasn’t lying… SO EASY. Use 1 tablespoon in a full wash load. 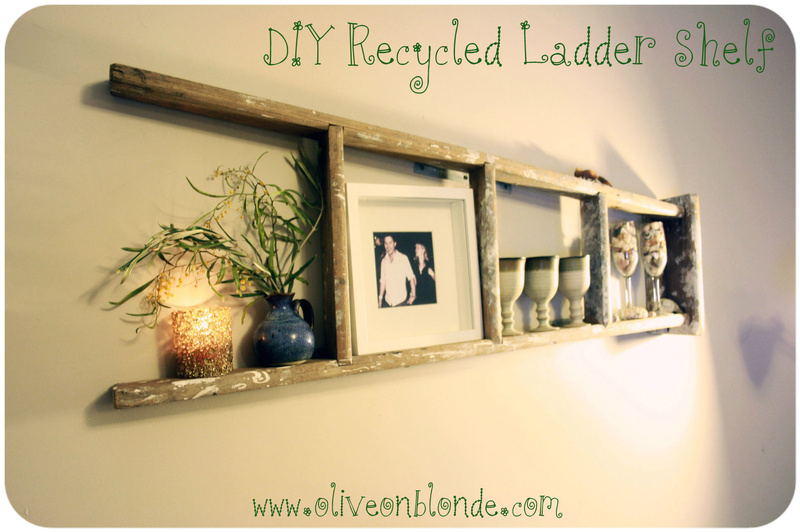 My love of all things old continues, my latest obsession being vintage wooden ladders! I find old, worn, loved-up ladders so charming – they transport me to a realm of nostalgia in the same way that teapots do. When I look at them I think about all the excited feet that could have stood on them before… young couples painting their first home together, an excited daddy-to-be preparing a nursery or the father that is always there to help out his kids (now adults) with any renovations. Maybe this pregnancy is making me more emotional than I first thought but either way it is a symbol that warms the cockles of me heart and I wanted to use a ladder in my home. All the better that it is an old unloved material that completely cancels out the need to chop down a new tree. Check vintage stores, gumtree, Ebay, opshops, the local tip and roadside collections. And remember… the more paint stains the better! Brackets – the amount will depend on the ladder size. For one this size I used two along the bottom and one to stabilise at the top. Extra pair of hands is useful in this project… maybe two if you have a longer ladder! 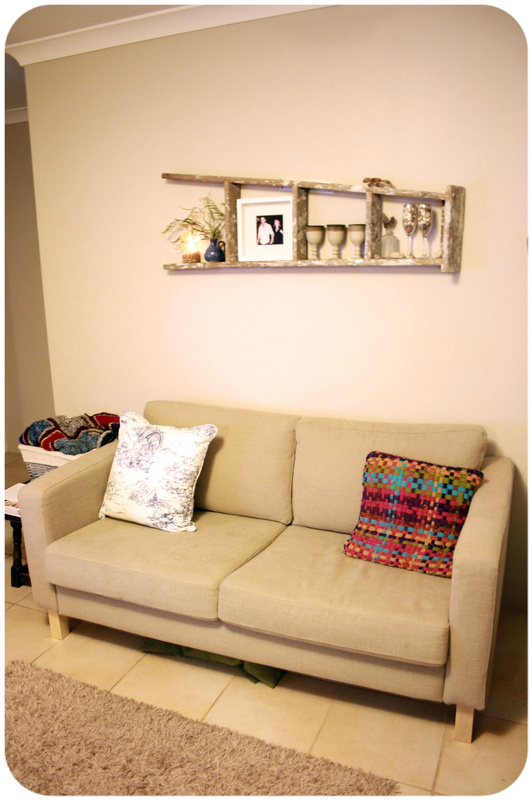 1) After you have found your ladder you need to pick the perfect spot for it! 2) If your ladder is a step ladder then you will need to take the two rails apart. Once apart choose which part of the ladder you will use… you may even want to use both! 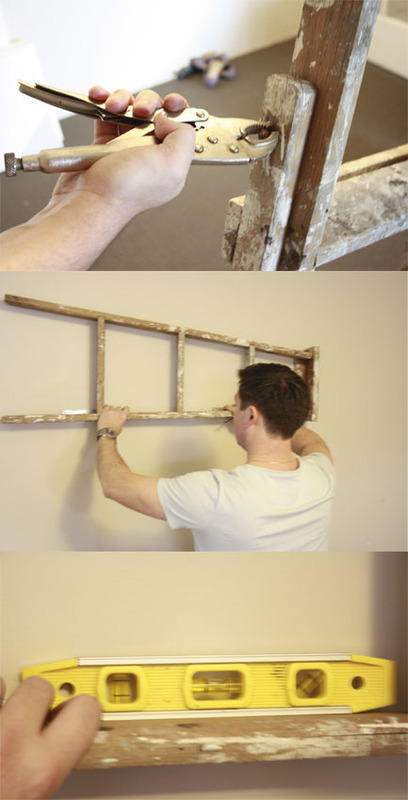 3) Hold your ladder up against the wall to measure whereabouts you want your shelf. 4) Measure with spirit level to ensure the ladder is level. 5) Borrow the spare set of hands and slide the brackets into place (where they will need to be to hold the ladder up) behind the ladder and quickly pencil in the holes. You want the brackets to be as hidden as possible which means the outside/underside of your ladder will sit on the bracket like a shelf, rather than being supported like a perch. If that doesn’t make sense just look at the third picture in the below sequence. 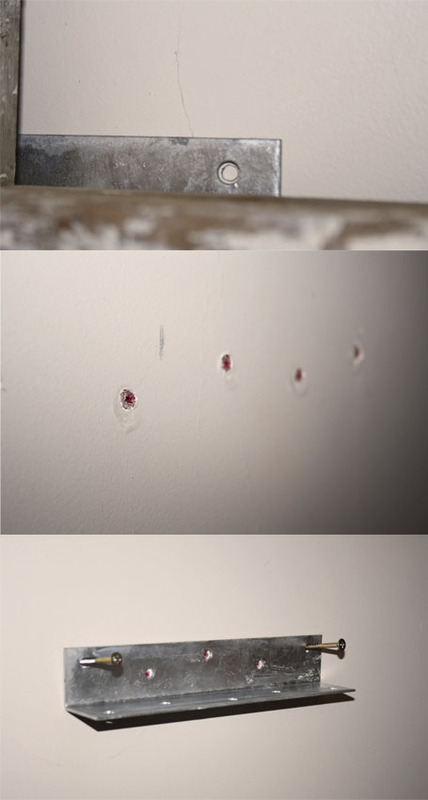 6) Drill the holes into the walls. Hammer in the wall plugs and then screw in your brackets. 7) Once your brackets are drilled in, rest your ladder upon them. Put a bracket on the top of your ladder to secure and stabilize it and repeat the bracket drilling process. 8) Once all your brackets are drilled in and your ladder feels securely ‘wedged’ you will need to screw the brackets into the ladder. Very gently drill screws into the ladder… you must be careful so as not to split the ladder. 10) Time to decorate! I had so much fun choosing what goodies to put on my ladder. Bobert (my leaf-tailed Gekko made from scrap metal) has pride of place and every time I look over at him walking up his little hill it makes me smile. Then I have the champagne glasses that Mark and I left our wedding venue still holding (completely accidental theft, I promise!) and I filled them with pebbles and shells that I collected the day after I met him. It is so lovely to be able to honor those little things that make your heart sing every time you look at them! 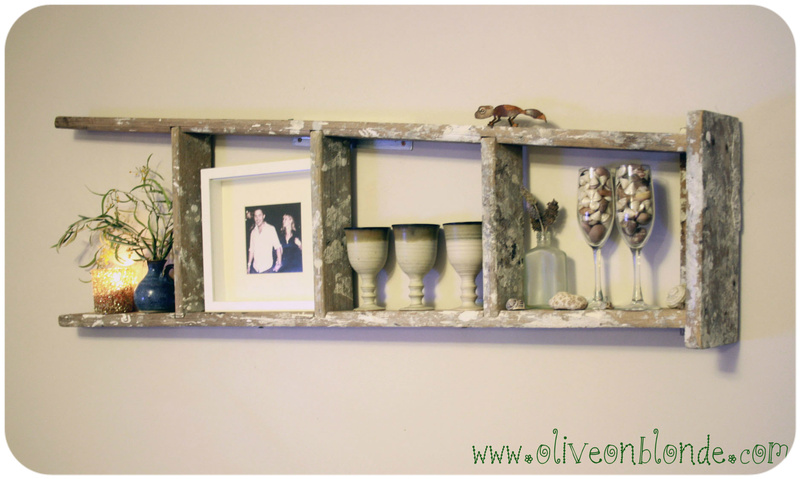 If you like this sort of quirky shelving you may also like my DIY Tutorial for “Book Shelves” wink wink. See that here. I will leave you with this beautiful quote about… what else?… ladders! The debate over deodorant and it’s links to cancer are just about as contentious as the great dairy debate. As yet “no conclusive research linking the use of underarm antiperspirants or deodorants and the subsequent development of breast cancer” (see studies here and here). BUT do we really need to a scientific nod of approval to be concerned or should we occasionally just employ some good ol’ common sense? The active ingredient in deodorant (unless otherwise stated) is aluminium and they can also contain parabens. Some research suggests that aluminum-based compounds may be absorbed through the skin and cause estrogen (hormonal) effects (that research is in here). Estrogen has the ability to promote the growth of breast cancer cells. A 2004 study found parabens in 18 of 20 samples of tissue from human breast tumours (see here). These findings are not uncommon as you can see from this study or this one or this one! So (for me) even though there is no categorical proof, I just don’t like the thought of rubbing aluminium, parabens and god knows whatever other chemicals in a sensitive region near my breasts and lymph nodes. I also don’t like the thought of a chemical blocking my pores especially when those pores are trying to excrete natural toxins from my body. 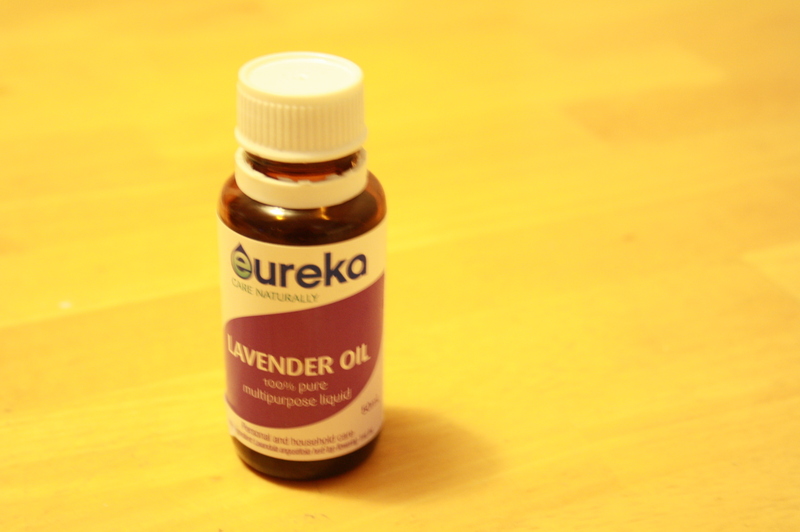 OPTIONAL – Essential Oil. I use Lavender and Lemon before! ‘Cornflour’ is much easier to say than ‘phthalate’! 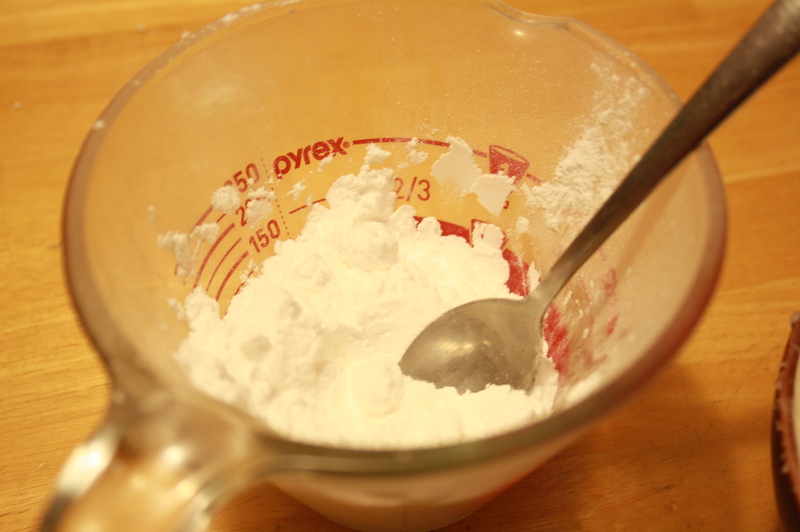 Mix equal amounts of cornflour and bicarb soda. Maybe start with 1/4Cup each. 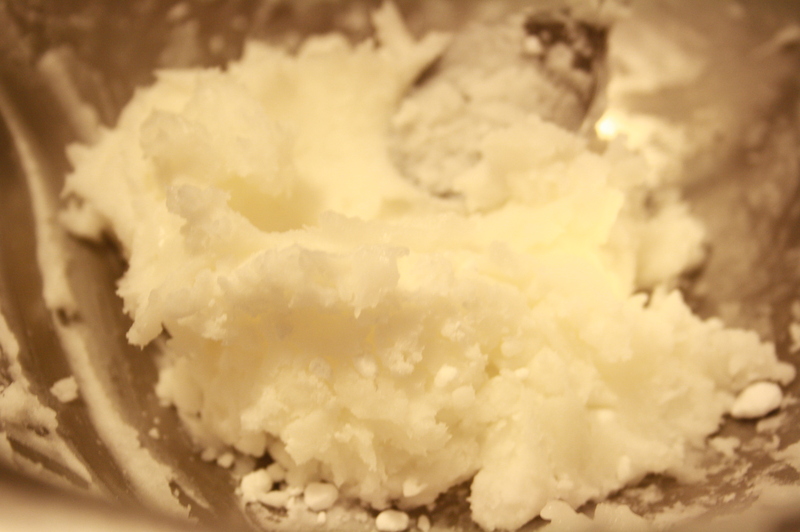 Add 2-3 Tablespoons coconut oil to start with and mix the ingredients until you get the right consistency. You want it to be a malleable paste . Get your Goldilocks on – it shouldn’t be too wet or dry! 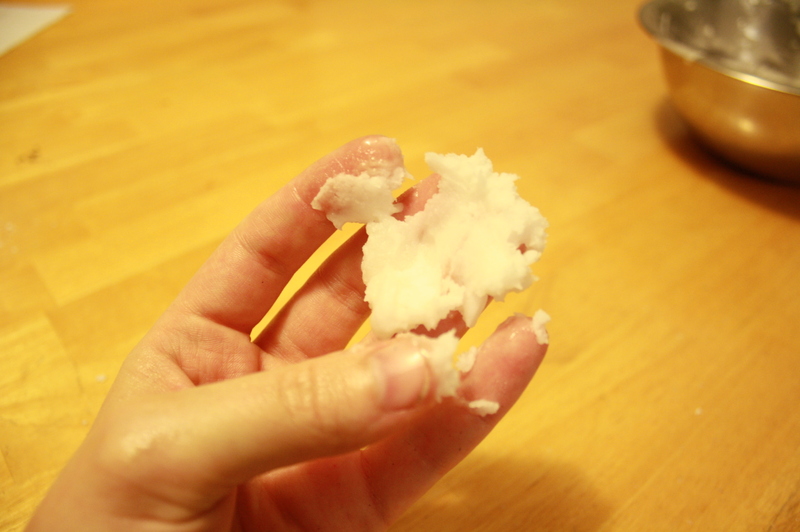 (if your coconut oil is too solid, warm it slightly until it is gooier). It is kinda like make scones! If you want, add some smelly essential oils to get a more fragrant deo. I added a few drops of Lavender Oil to mine because I love it but even by itself the deodorant smells like coconut which is pretty yummy anyway! NOTE: If you are pregnant some essential oils should not be used. For a full list see here. 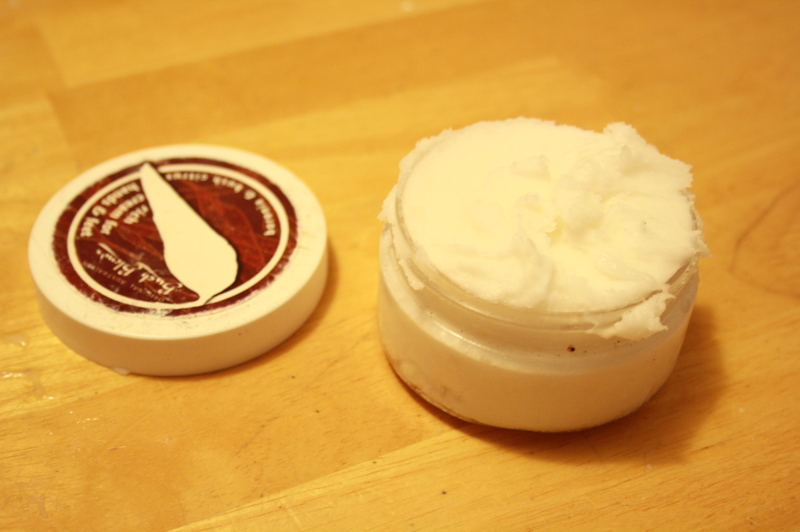 I store our deodorant in an old beauty container but you can use a jar or any thing with a lid really. Alternately, you could save your own deodorant container if you’ve got a wind-on one and pack your deodorant into there! Reuse is better than recycle after all. I keep mine in my bathroom and it stays at a good consistency. That being said, coconut oil melts really quickly in warmer temperatures so if your bathroom heats up you may want to keep it in the fridge. That could actually be really soothing to apply in a hot summer! 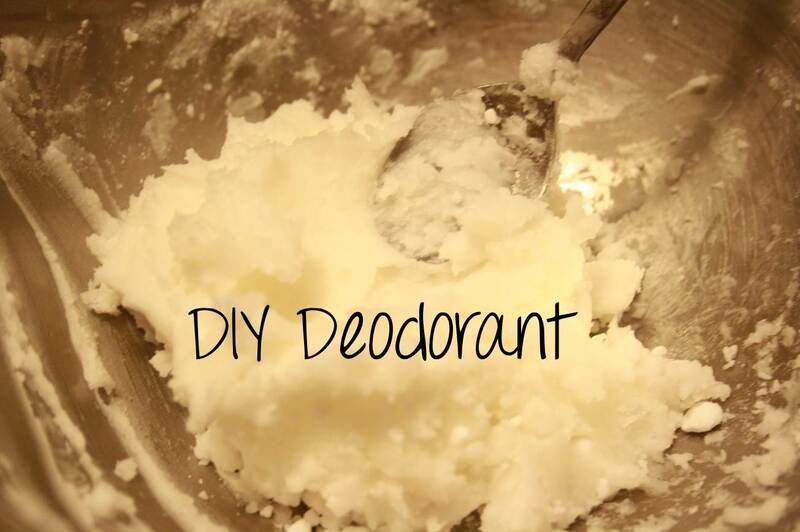 If your deodorant gets too solid, place some warm water in a bowl and then put your container into the water for a few minutes. As I’ve just mentioned the coconut oil will react quickly and become soft and malleable. Expiry – this stuff doesn’t go off. Use it as long as you’d like. Scrape off some of the mix (I use my fingers but you can use a spoon or knife or whatever) and apply to your underarms with your fingertips. It may look powdery or seem like it would be sticky but once you massage it into your pits it is surprisingly dry and fresh feeling. My husband and I have been using this since the Less Is More Festival back in February – so it has been tried and tested on an Australian summer – and amazingly it works! Actually, more than just ‘working’ it is the most effective deo either of us have ever used. It is not a antiperspirant but it 100% stops any odour. Neither of us have even had to reapply throughout the day! 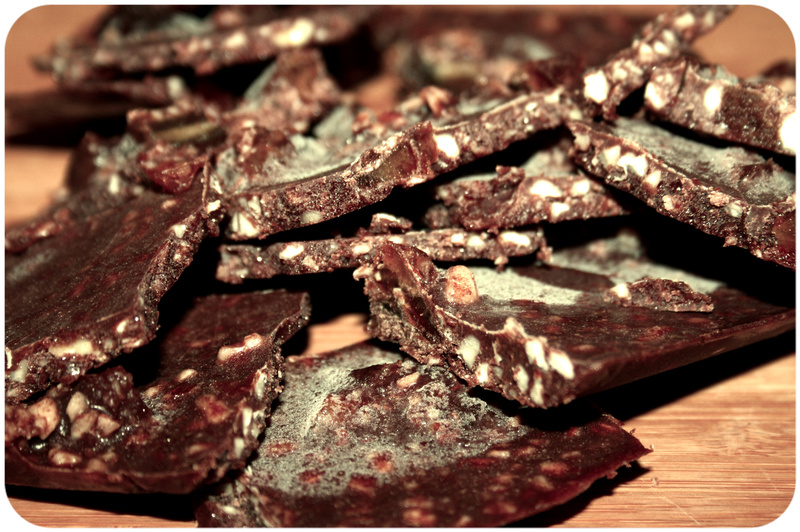 Other than my Raw Chocolate (see that here) this is my absolute favourite DIY discovery – 10 out of 10 Olives!!! Looks almost good enough to eat! Enjoy – and let me know how you go in the Comments! And just like that… my life will never be the same again! Everyday, bang on 2pm, I find myself with an all-consuming urge to seek and destroy all chocolate products within a 5km radius. 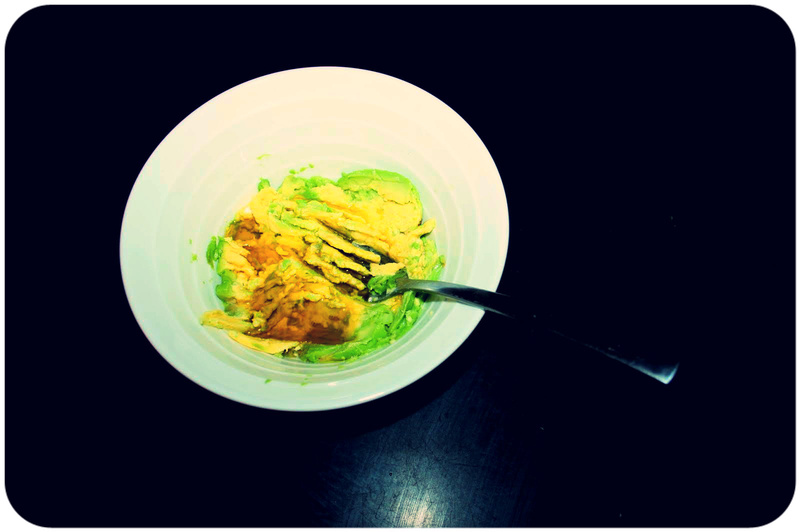 Instead of denying myself though I wanted to try and make my own healthy version. Then I was reading a post on the Wellness Warrior’s blog where she provided a super simple chocolate recipe with just 5 nutritious ingredients and 6 easy steps. Surely it can’t be so simple? Well… IT IS. This is the best stuff I have ever made and both my husband and I took stashes into the office to experiment on our colleagues. Feedback was overwhelmingly positive. Woot woot! This will only take you a few minutes and is so deliciously indulgent that I can guarantee you will be hooked as well! Dates, Almonds and Maple Syrup – can all be found at supermarkets and grocery stores. 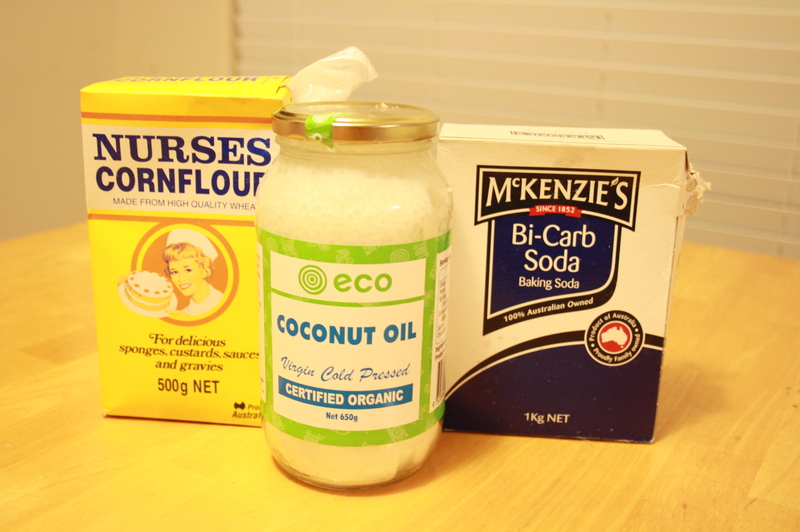 Coconut Oil – I have recently heard that Coconut Oil is available in supermarkets in the Asian food section. 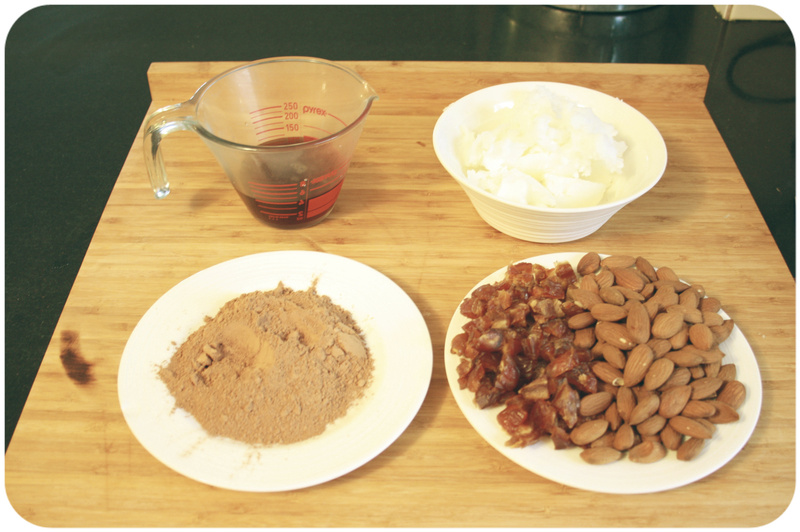 Raw Cacao Powder – I have only seen this at health food stores or bulk style shops. A handful of medjool dates, chopped (I will use more next time… probably 15. But I LOVE dates at the moment). 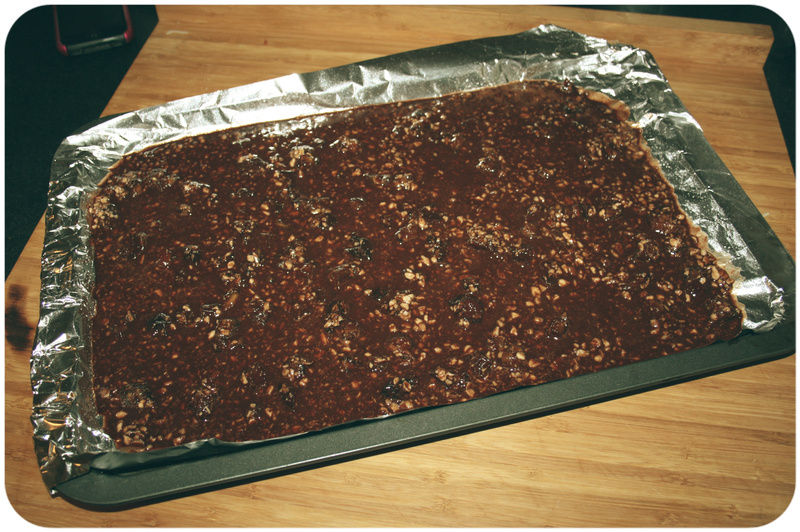 1) Line a baking tray with baking paper or alfoil and place in the freezer to chill. 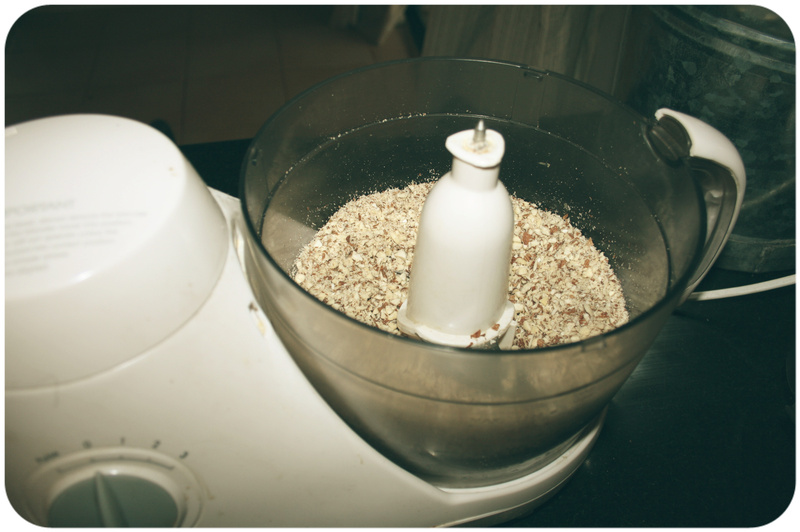 2) Grind almonds in a blender / food processor until they are finely chopped (not quite a powder though). 3) If your coconut oil is solid, gently warm in a saucepan until it is all liquid (do not boil!). 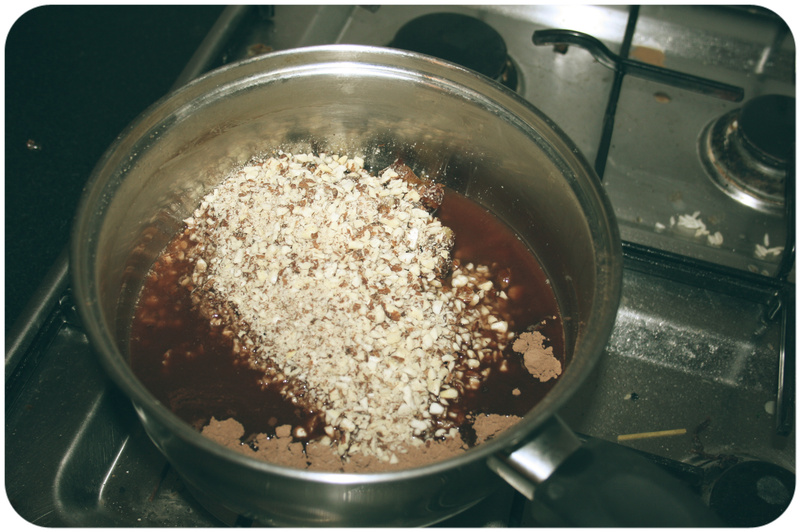 4) Remove from heat and stir in the remaining ingredients; almonds, raw cacao, dates and maple syrup. 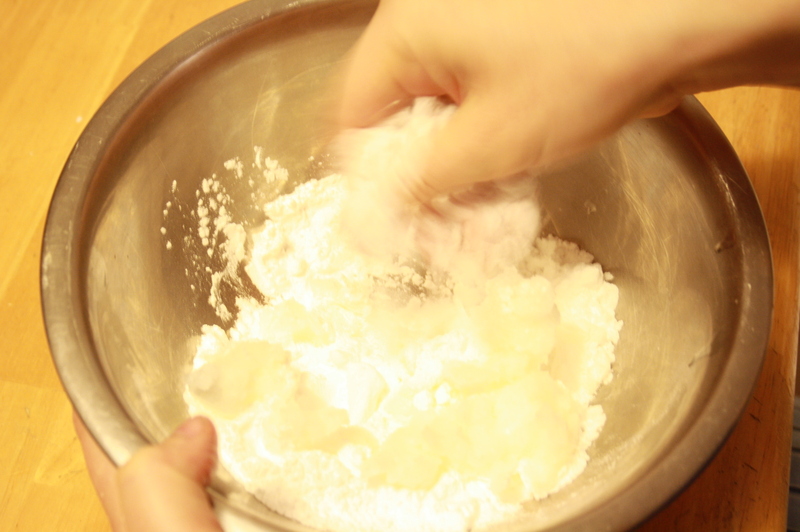 5) Pour the mixture onto your tray and spread it out evenly then put into the freezer until it has set. This won’t even take an hour! 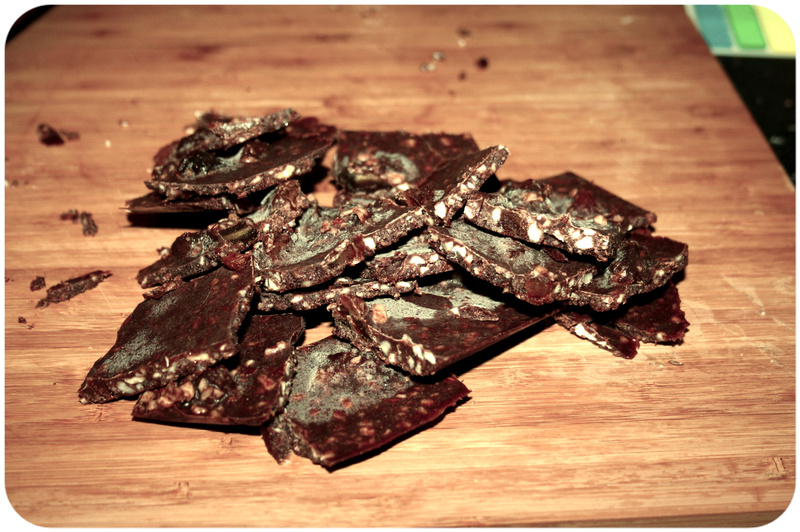 6) Chop the chocolate into chunks or rough squares. 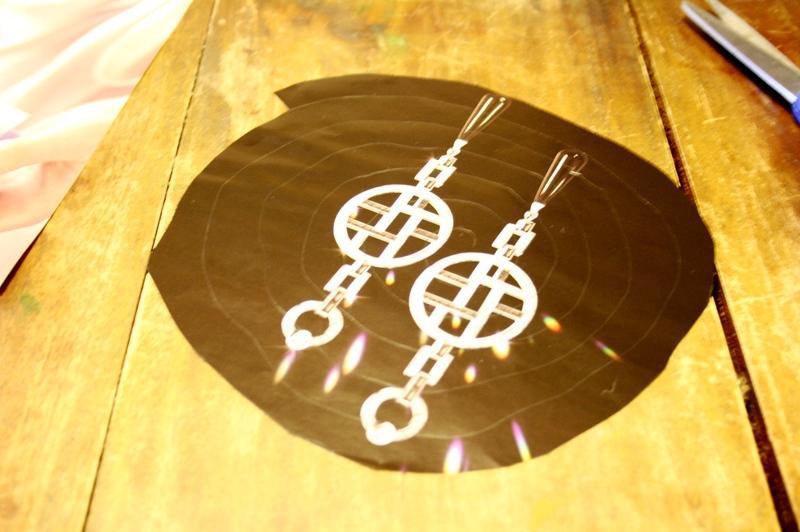 For Christmas pressies I am going to try and set the chocolate using cookie cutters shapes too! 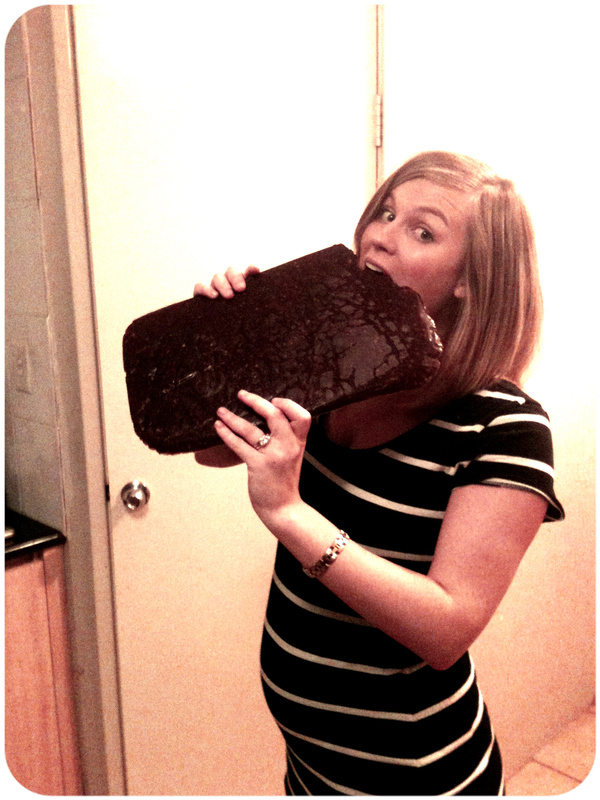 NOTE: That is a pregnant belly… not a chocolate belly!!! 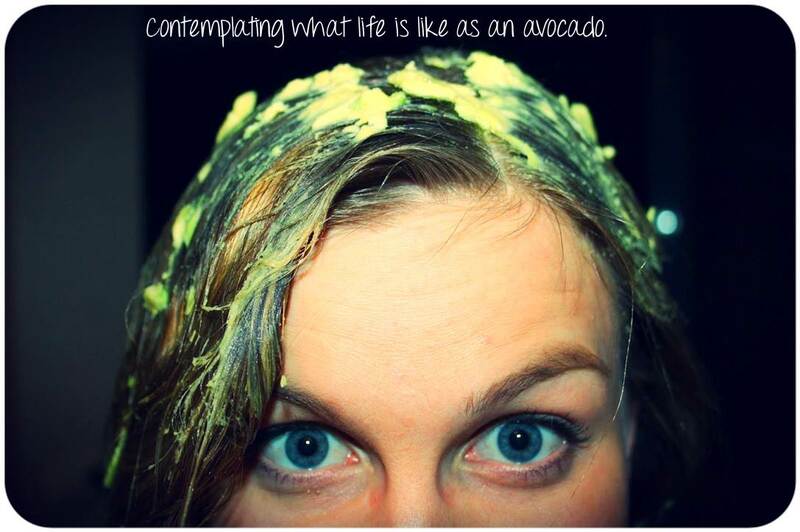 While it may seem (and feel) a little odd to be mushing avocado into your lovely locks, it is actually a tried and tested beauty trick! Avocado’s are a very oily fruit and this oil actually forms a protective barrier on your hair which promotes elasticity… basically it makes your hair soft, flexible and hydrated. This nourishment also means that your hair is less susceptible to breakages and becoming dry – great for the other blondies out there! I think the best part about it though is that you avoid using nasty chemicals that are found in your standard products, it’s cruelty free and reduces wasteful packaging. Also, a very common ingredient in your average hair products is Palm Oil which is incredibly damaging environmentally (read about that here). 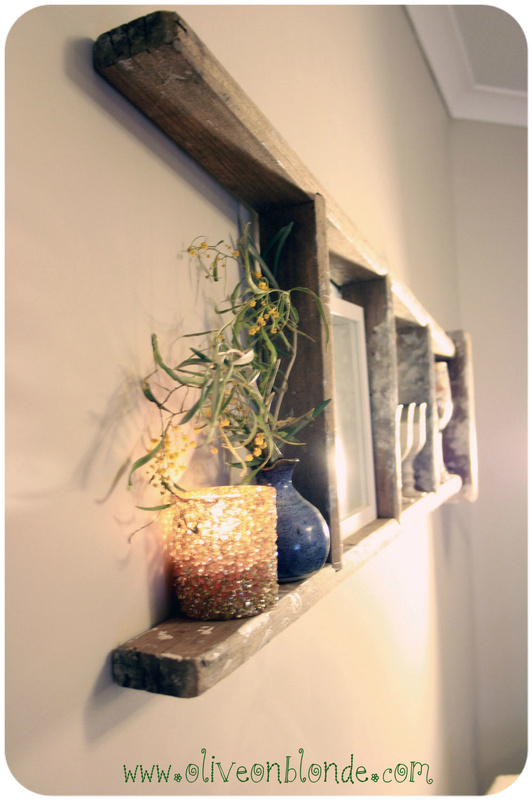 So get ready to have a laugh and give this super simple beauty DIY a go! 1. 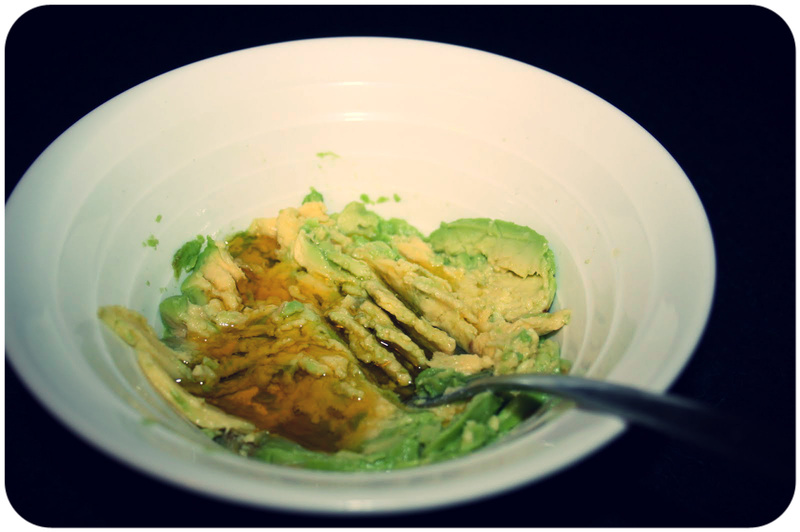 Mash avocado. Then add lavender and olive oil and mash again. 2. Apply to hair, focusing on the ends. If hair is still a little dry then put a put of olive oil on hands and run through. 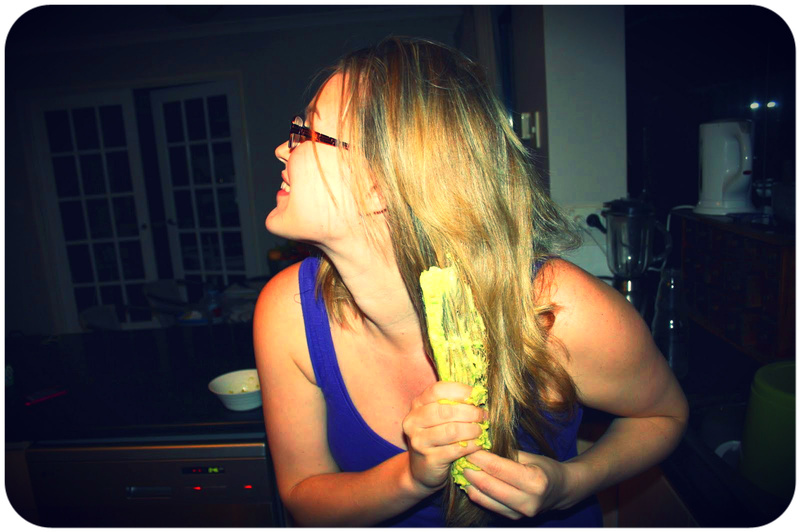 Ewww… there is salad in my hair! Of course I am only kidding about the last picture but I definitely did feel the benefits of the treatment. It was so nice applying a mask to my hair and knowing that it was made of organic, natural ingredients rather than synthetics, parabens and artificial fragrances. Are there any natural beauty secrets that you use? Would love to hear in the comments. We have all heard of Fair Trade chocolate and coffee – but did you ever stop to think about flowers? Yep, those brightly cellophaned flowers that you buy as last minute presents are generally imported from countries like Zimbabwe, Colombia and Kenya and have often been produced through unethical working conditions and environmentally unsound practices. It makes me feel so bloody ungrateful when I catch myself grumbling about the office when these plantation workers are forced to work over 12 hours a day for less than a dollar, live in cramped and unsafe conditions and handle harsh chemicals without any protective gear. In Kenya right now the Ngiro River – a life sustaining river resource for farmers – is being drunk dry due to the booming cut-flower trade. That’s right, people are dying of thirst and farms do not have access to enough water to irrigate their crops just so wealthier nations can have a pretty floral arrangements on their breakfast tables. First-world greed epitomised. I am going to write a proper article about this later because I find it jaw-dropping that it is not a more spoken-of issue. BUT! In the meantime I do love flowers and it made me wonder if there were any eco solutions out there. Of course there was! 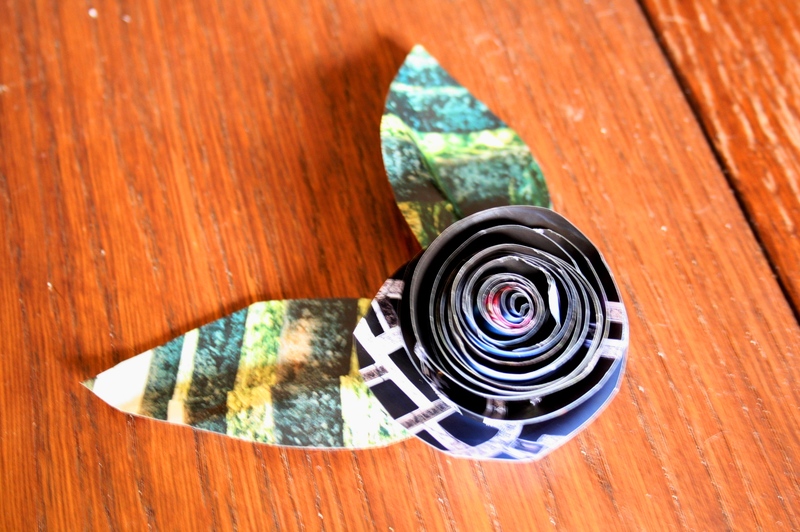 I stumbled across these stunning Rolled Roses by Jones Design Company (their tutorial here) and figured that I would give it a go using old magazines. They’ll be colourful, made from a ‘waste product’, won’t need to be watered and will never wilt. Here is how to do it. 1. Cut your pages into squares. 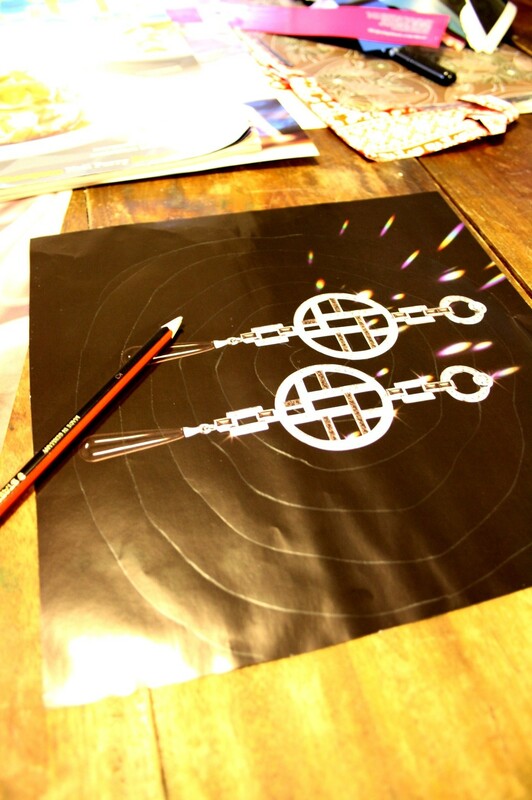 Draw an irregular spiral in pencil. 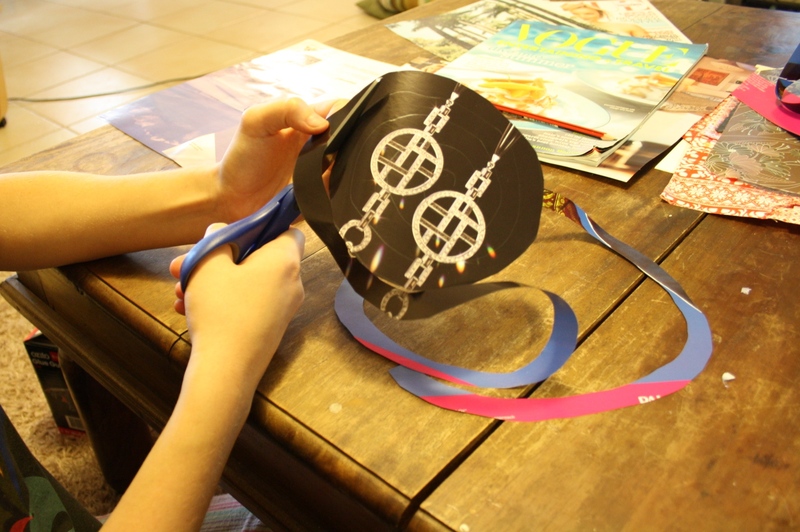 2.Cut the outline of the circle out. 4. Starting at the outside start rolling your paper in a tight rosette. Whatever side of the paper you want as the petals should be on the inside of the roll. I rolled this flower the wrong way and the ‘petals’ ended up black rather than that beautiful blue. 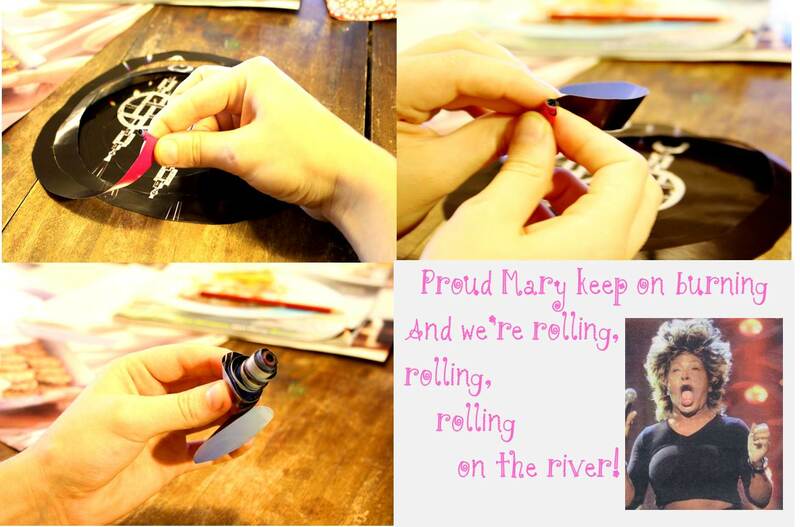 This takes a little while… so maybe whack on ‘Proud Mary’ by Tina Turner and sing while you roll. 5. 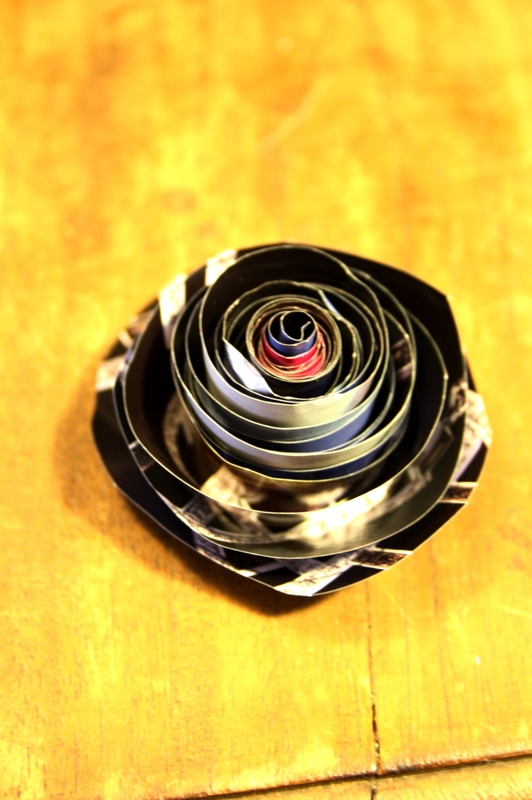 As you can see in the bottom left square you will roll until there is only the circular centre of the flower left. 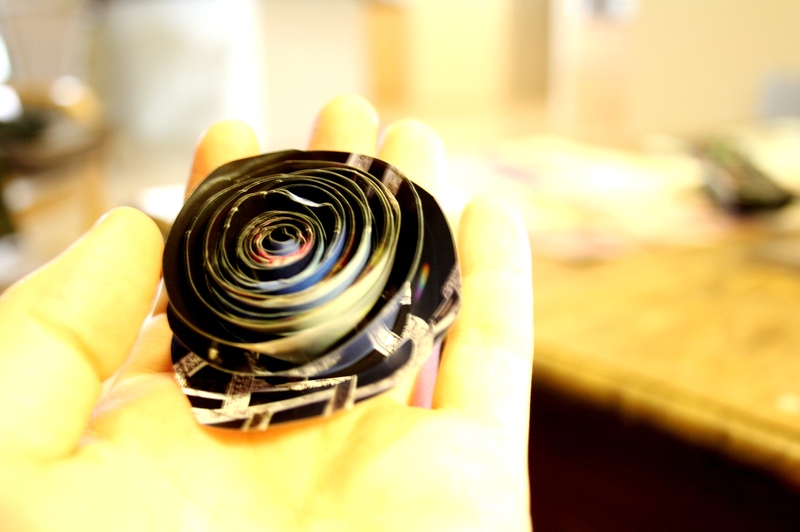 Put a splodge of hot glue onto the circle and press the bottom of the rosette onto it. While the glue is drying you will need to have a bit of a play with it… let it unfurl, unscrew bits looser, twist bits tighter until you have the perfect looking rose. 5. It takes a bit of fiddling before you get a perfect looking little rose. 6. Marvel at your rose for a second before moving on to the next step. 7. Now it is time for the leaves. 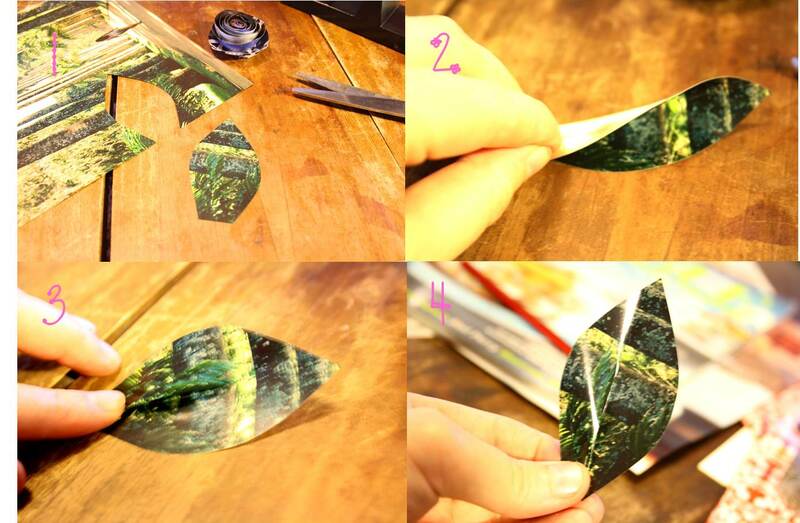 (1) Cut a simple leaf shape out. 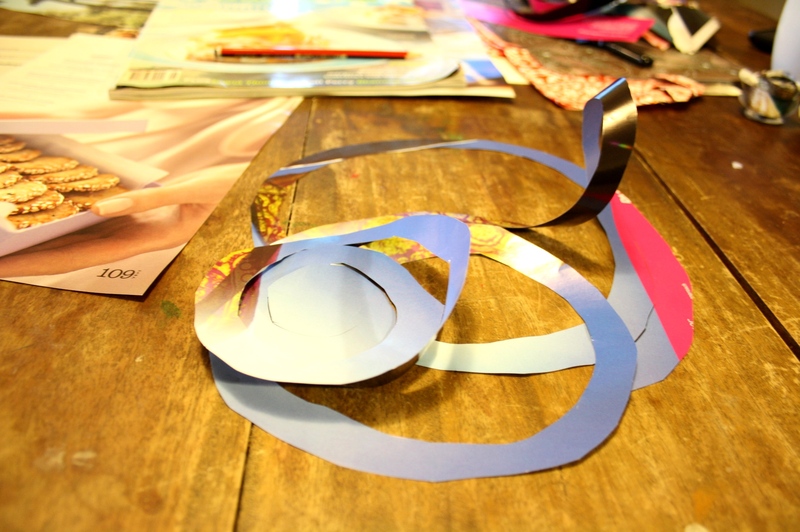 (2) Fold the base in half before (3) folding back onto itself. Then (4) dab a bit of hot glue within the folds and stick it in place. 8. The glue your leaves to the back of the rose. If you want a bouquet of roses then bend a hook in the end of your florists wire and glue on the wire in whatever arrangement you like. As the above rose was my first I kept practicing away. You end up very quick at it and the flowers look better each time. Of course if you are already crafty your flower probably looks perfect first go. Damn you talented people! 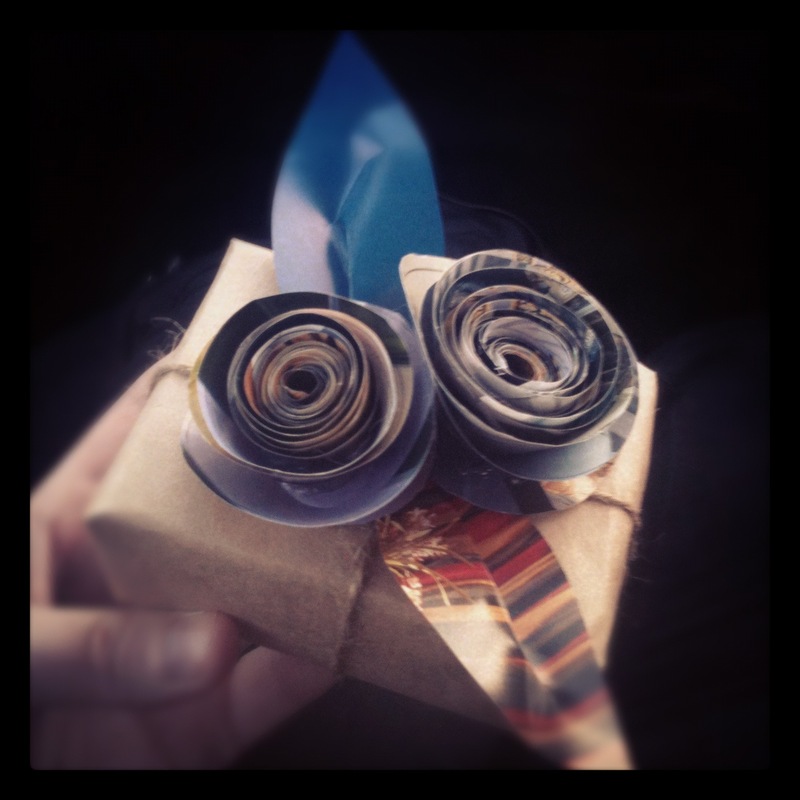 My favorite ‘other’ application for my roses was using them to tszuj up gift wrapping. Sometimes people have told me off just for wrapping their presents in boring brown paper or (shock horror) newspaper and I figure that as long as I add one of these there can be no more complaining!!! This wrap was made using an old paper bag, some left over natural twine and scrap magazines. I think it looks pretty spesh. 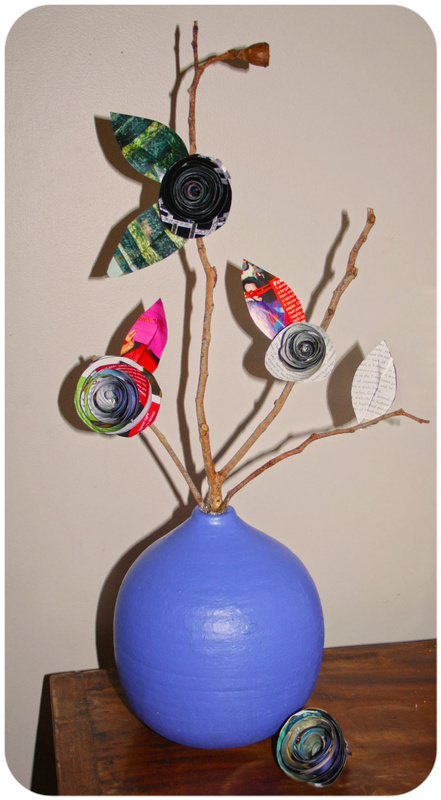 I also attempted a sustainable flower arrangement in my DIY Painted Vase post (see that here). While it looks a bit dinky in that photo, it is quite gorgeous at the entrance to our house. If you give it a go let me know in comments… or if you have any handy tips on sustainable gift-wrapping. Or just to say hi! I get lonely sometimes.